Chichu Art Museum was constructed in 2004. 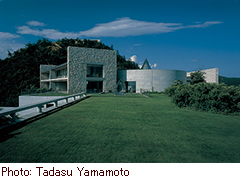 Artworks by Claude Monet, James Turrell, and Walter De Maria are on permanent display in a building designed by Tadao Ando. Taking form as artists and architect bounced ideas off each other, the building in its entirety can be called a massive site-specific art work. 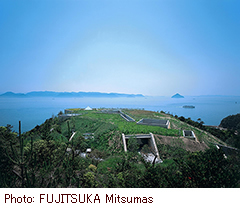 To ensure that the museum does not affect the beautiful scenery of Naoshima, the majority of the building is located underground. Despite its positioning, it receives an abundance of natural light, changing the appearance of the artworks and the ambience of the space itself with the passage of the days and the seasons. Information about Artist and Architect is here. Information about Cafe and shop is here. ※ Entrance ticket are required in order to visit the Chichu Cafe. Information about programs (Open Sky Night Program and Private Tours) is here. Other useful information is here. 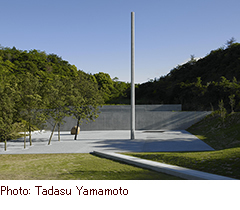 A museum resulting from collaboration between the internationally acclaimed artist Lee Ufan and the architect Tadao Ando. The Ando-designed semi-underground structure houses paintings and sculptures by Lee Ufan spanning a period from the 1970s to the present day. Lee’s works resonate with Ando’s building, giving visitors an impression of both stillness and dynamism. Positioned in isolation in a valley surrounded by mountains and sea, the museum offers a harmony between nature, architecture, and art, where visitors will be offered an opportunity to return to their original natures and to find time for quiet reflection in a society overflowing with material goods. Information about shop is here. Benesse House Museum opened in 1992 as a facility integrating a museum with a hotel, based on the concept of “Coexistence of nature, art and architecture.” The facility consists of four buildings, all designed by Tadao Ando. In addition to the works in its collection, the Museum also contains permanent site-specific installations that artists have created especially for this building, locating the installations on their own and designing the works for those spaces. The Museum’s artworks are found not just within its galleries, but in all parts of the building, as well as along the seashore that borders the complex and in the nearby forest. One of the pleasures of visiting Benesse House is unexpectedly encountering works of art, not only within the walls of the Museum but also while strolling around the grounds, enjoying the abundant natural beauty of the Inland Sea region. Please check Benesse Art Site Naoshima’s official home page for irregular closeing dates. Rehabilitation Certificates, or Mental Disability Certificates) are not granted free entry. Information about restaurant, cafe and shop is here. There are many outdoor art works at the museum area. It might also be fun to walk around there to enjoy them and the scenery. Information is here.